Orange County Fire Rescue Chiefs stand with District 2 Commissioner Bryan Nelson to celebrate the newly renovated Fire Station 28. 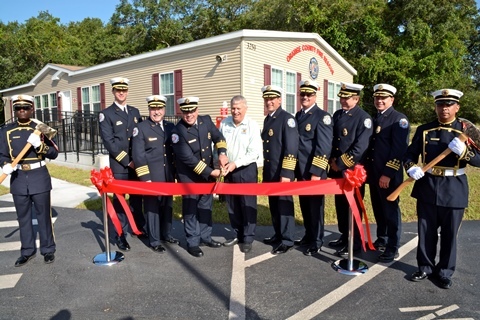 On Friday, August 5, 2016, Orange County Fire Rescue celebrated the newly renovated Fire Station 28 with a Ribbon Cutting Ceremony. Located in Apopka, Fire Station 28 ran 2,491 calls for service during the last fiscal year, 2,025 of which were EMS calls. The renovation of Station 28 was led by the Fire Facilities section in conjunction with several County partners. The new fire station is nearly double in size, going from the original 1,100 square feet to 2,000 square feet of living space. The completion of this station supports the fine work the men and women of Station 28 perform daily while providing critical services to the community. “Our goal is to provide our firefighters a comfortable, functional space to work and live, as they serve our community 24 hours a day,” said Drozd. Fire Station 28 is located at 3250 Clarcona Road, Apopka, Florida 32703. It was established in 1988 and houses a three-person engine, two-person rescue and 2,500-gallon tanker.